Whale Rescue Blade™ H-1 - Spyderco, Inc. Page 779 – Spyderco, Inc.
Spyderco developed the Whale Rescue Blade for wildlife conservation groups that specialize in rescuing marine mammals entangled in fishing nets and lines. 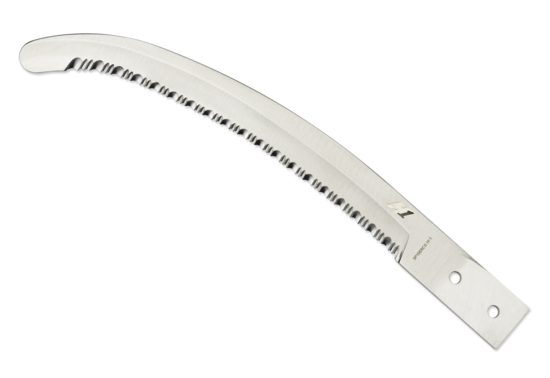 When attached to a 10-foot pole, this specially designed blunt-tipped blade can be gently maneuvered under the lines without risking injury to the animal. Once in place, the fully serrated SpyderEdge cutting edge and strategically designed blade curve maximize cutting power to efficiently sever wet, tangled lines and netting. The original Whale Rescue Blade was made from 440C stainless steel and available exclusively to recognized wildlife conservation organizations; however, based largely on interest from military special operations units, in 2012 Spyderco decided to increase production and make it commercially available for the first time. The commercial version retains all the salient qualities of the original, but with the added benefit of being made from H-1 steel. H-1 is a unique nitrogen-based austenitic steel that is completely impervious to rust, and therefore the ultimate material for this one-of-a-kind blade. NOTE: The rescue of marine wildlife requires highly specialized training and equipment and can only be performed by authorized personnel. It is illegal for civilians to attempt any marine wildlife rescue activities on their own.